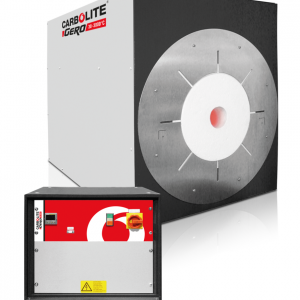 These top loading chamber furnaces are particularly suited for applications involving tall crucibles and heavy components. Heating elements in all four walls minimise the risk of damage from spills and ensures good temperature uniformity. The smaller two furnaces may be benchmounted, but best access is provided when these furnaces are located on the floor. 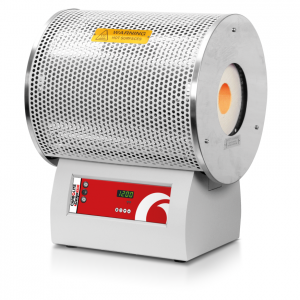 The RHF range of silicon carbide heated high temperature chamber furnaces comprises four chamber sizes, each available with three maximum operating temperatures of 1400 °C, 1500 °C and 1600 °C. 1700 °C and 1800 °C models. The two smaller models in each temperature are bench mounted and the larger units are floor-standing. 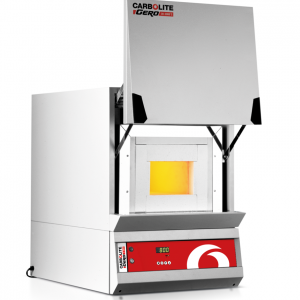 These furnaces may be customised in order to satisfy specific customer requirements, e. g. the addition of catalytic afterburners for ceramic binder burn-off applications. BLF bottom loading furnaces use an electrically operated elevator hearth, which as it rises into the furnace chamber, lifts the load into the heated zone. 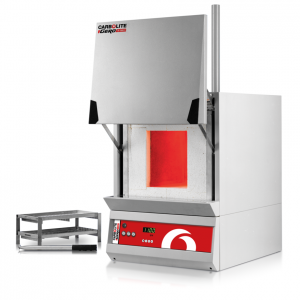 This furnace provides the following advantages: easy loading of samples and uniform heating achieved by locating elements in all six side walls of the chamber. 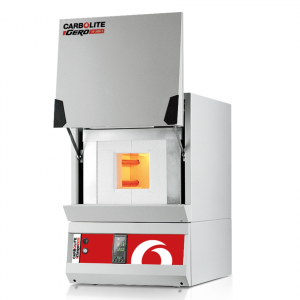 The 1600 °C is ideal for sintering of zirconia dental crowns and frameworks. The silicon carbide heating elements will not cause discolouration of the zirconia. 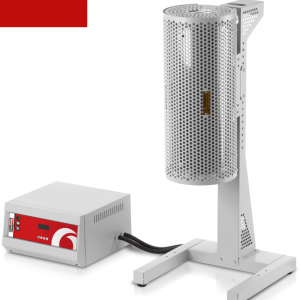 The AAF ashing furnace range is designed specifically to provide optimum ashing conditions to ensure complete combustion of the sample. The AAF 11/3 & AAF 11/7 ashing furnaces provide a continuous flow of preheated air through the chamber, and are designed to comply with ISO 1171:2010, ASTM D3174-04: 2010 and ASTM D4422. 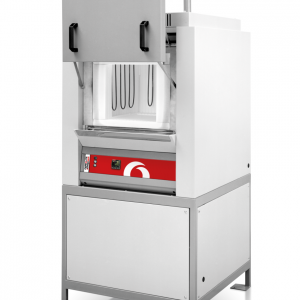 For those laboratories where ashing is interspersed with other heat treatment work the ashing furnace AAF 12/18 & AAF 12/32 provide all of the advantages of the AAF design, but with a higher maximum operating temperature of 1200 °C. 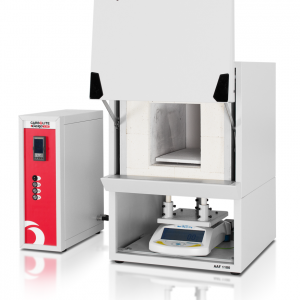 The AAF-BAL thermogravimetric analysis (TGA) furnace incorporates an integral balance. 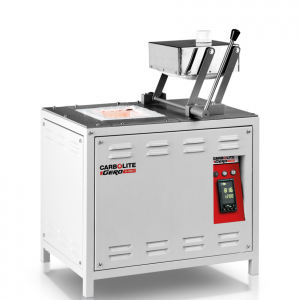 It can be used for loss on ignition applications where weight change of the sample must be monitored during the heating process. 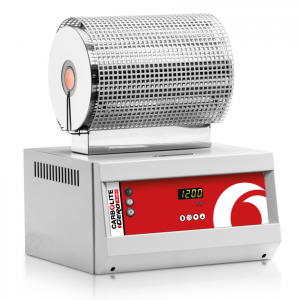 The AAF-BAL ashing furnace is fitted with an integral balance and can be used for loss on ignition (LOI) applications. Weight change of the sample is monitored during the heating process and this is required, for example, in the determination of organic matter content in materials such as sediment, sludge, soil and waste. Inorganic materials such as cement, lime, calcinated bauxite and refractories can also be tested. Some analysis techniques may be affected by alumina or silica dust (Al2O3 at SiO2) – the materials normally used to construct furnace chambers. To avoid this the GSM furnace chamber is constructed from a fused quartz material. This design also offers superior containment of aggressive and corrosive vapours such as sulphuric, nitric and hydrochloric acids by keeping them away from the heating elements. Additionally if an optional gas inlet is specified, the enclosed design minimises gas leakages from the chamber. 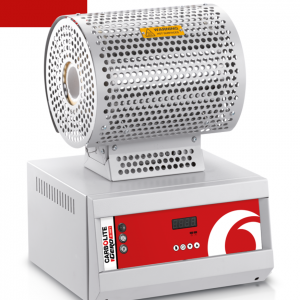 The ABF Afterburner Ashing Furnace is particularly suitable for ashing larger samples or materials such as biomass, which are likely to generate substantial amounts of smoke. The furnace comprises a large main combustion chamber equipped as standard with a two tier set of sample baskets. The exhaust from the main chamber is processed through a high temperature afterburner designed to further process fumes and smoke. 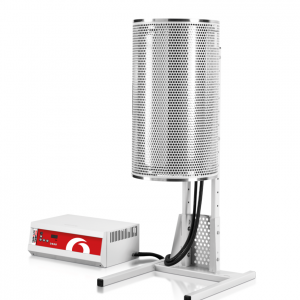 The benefit of this design is its flexibility with the use of tube adapters the same tube furnace can be used with a variety of tube diameters. The EHA are single zone furnaces and the EHC are three zone furnaces. This range of tube furnaces does not include an integral work tube and one must be selected as an additional item. The work tube length is dependent on the application eg for use with modified atmosphere or vacuum. The use of a separate work tube has the advantage of protecting the heating elements from damage or contamination. 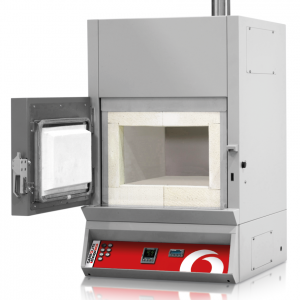 The compact vertical tube furnace range EVA / EVC uses free radiating wire elements embedded within the insulation of the furnace body. The EVA are single zone furnaces and the EVC are three zone furnaces. The MTF wire wound tube furnaces, like the larger diameter CTF range use a wire element that is wound directly onto a fixed integral ceramic work tube. 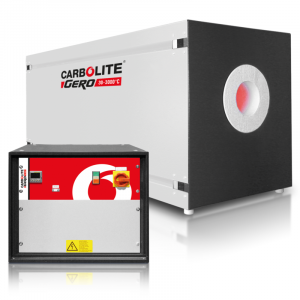 The tube furnace range GHA (single zone) / GHC (three zone) uses free radiating wire elements embedded within the insulation of the furnace body. The benefit of this design is its flexibility; with the use of tube adapters the same furnace can be used with a variety of tube diameters. The extended uniform zone in the mid-section of the work tube in the GHC 3-zone furnace is achieved with the use of end zone controllers which track the centre zone temperature and compensate for the loss of heat from the tube ends. 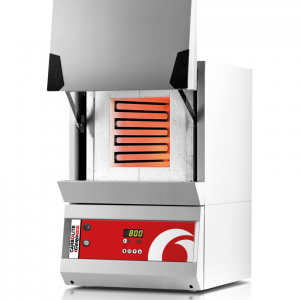 The tube furnace range GVA (single zone) / GVC (three zone) uses free radiating wire elements embedded within the insulation of the furnace body. The benefit of this design is its flexibility with the use of tube adapters the same furnace can be used with a variety of tube diameters. The extended uniform zone in the mid-section of the work tube in the GVC 3-zone furnace is achieved with the use of end zone controllers which track the centre zone temperature and compensate for the loss of heat from the tube ends. This tube furnace range does not include an integral work tube and one must be selected as an additional item. The work tube length is dependent on the application, for example, for use with modified atmosphere or vacuum. The use of a separate work tube has the advantage of protecting the heating elements from damage or contamination. The CTF single zone and TZF 3-zone wire wound tube furnaces use a wire element that is wound directly onto a fixed diameter integral ceramic work tube. This simple and economical design of both the CTF and TZF provides a tube furnace that can be used without the need to purchase an additional work tube. However, should vacuum or a modified atmosphere be required, it is necessary to use a separate additional slide-in work tube in order to provide the required length needed to fit end seals. Similarly, in some circumstances a work tube that has different physical or chemical properties to the fixed work tube may be required. The TZF heated length is divided into 3 zones. An extended uniform zone in the mid-section of the work tube is achieved with the use of end zone controllers which track the centre zone for temperature and compensate for the loss of heat from the tube furnace ends. The use of an additional slide-in work tube protects the integral work tube for the TZF and heating element. The FHA, single zone, and FHC, 3-zone, tube furnaces can be used either vertically or horizontally and have a maximum operating temperature of 1350 °C. 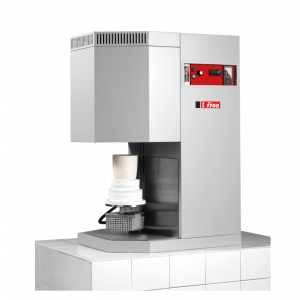 The extensive F range of tube furnaces is offered with a wide range of accessories. 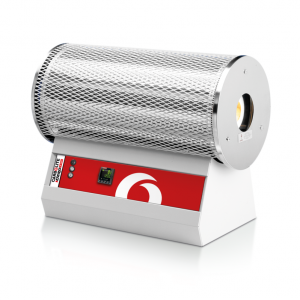 The furnaces comprise ceramic fibre modules with a high quality 5 mm APM wire heating element mounted in the insulation, held in position by a ceramic holding ridge. The low thermal mass ceramic fibre insulation ensures low energy consumption and allows fast heating rates. The control thermocouple is a high grade type S thermocouple. 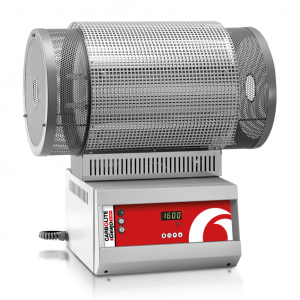 Additionally, the tube furnace is available with up to 8 heating zones for the most precise temperature control and uniformity. 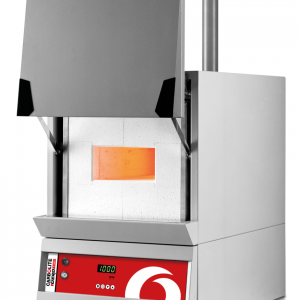 The AZ is an eight zone tube furnace for controlled temperature profiles. These zones can be used to generate temperature profiles along the heated length of the furnace. 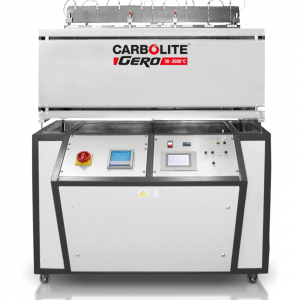 The Carbolite Gero high temperature tube furnaces HTRH can be used horizontally up to 1800 °C. The high-grade insulation materials guarantee low energy consumption and high heating rates due to their low thermal conductivity. The insulation and molybdenum disilicide (MoSi2) heating elements are installed in the rectangular housing. The heating elements are vertically hanging and can be replaced easily. At higher temperatures and in the presence of oxygen, MoSi2develops an oxide (SiO2) layer, which protects the heating elements against further thermal or chemical corrosion.